As if adding Ariana Grande’s likeness to Square Enix’s free to play mobile game Final Fantasy Brave Exvius wasn’t strange enough, her song “Touch It,” will also be given a fully orchestrated remix for the game. It’s kind of ….good? Just in case you haven’t listened to the oeuvre of Ariana Grande: think Mariah Carey, but with worse enunciation. To give her the melodramatic treatment of a Final Fantasy game is kind of hilarious, but not not totally incongruous. The remix of “Touch It” kind of sounds like something Yuna would sing in Final Fantasy X-II. The original song is about longing and desire, but with this treatment, the aforementioned longing is being given the weight of an impending apocalypse or something. You know, Final Fantasy stuff. 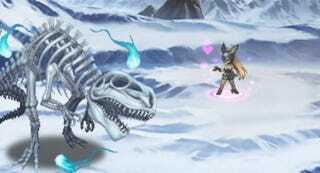 If you’re desperate to know when, exactly, Ariana Grande will grace Final Fantasy Brave Exvius with her presence, Square Enix said that, “more details will be released in the middle of January,” in a press release this morning. In the meantime, I guess you’ll have to tide yourself over with this picture of a man playing a french horn for the “Touch It” remix, who seems to be pondering how his life got to this point.